December is, unlike its gloomier brother November, really busy and bursting with holiday cheer. December includes buzzwords such as reindeer, Xmas lights, candles and gifts. So get ready for all the spiked eggnog, holiday and benefit parties because the last month of 2013 will be a ride! We can't believe it either but it's been three years since baby Bushwick Daily was born. These days, the web-kid is running around full speed, asking to celebrate with all you, lovely readers (and prematurely requesting alcoholic beverages). 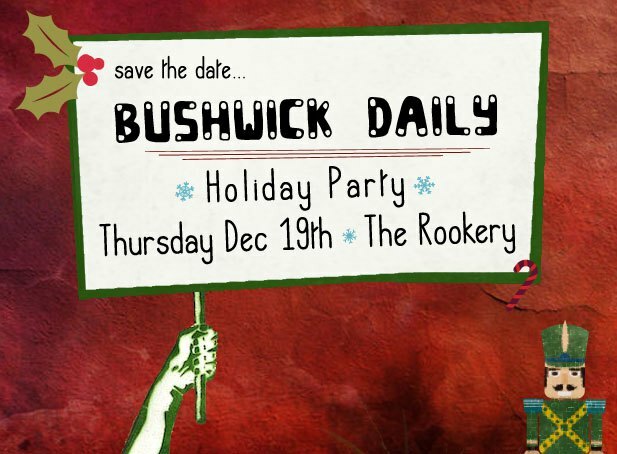 On December 19th, from 7PM till we drop, one of our most fave bars, The Rookery, will graciously host this year's Holiday/Birthday madness. Look forward to music by the legendary chef of The Rookery, Opal, who leads a parallel life as a kickass party DJ, a photo booth like only Bushwick Daily does it, a super-special Bushwick Daily Birthday cocktail and a Bushwick Farmer's Market stand! 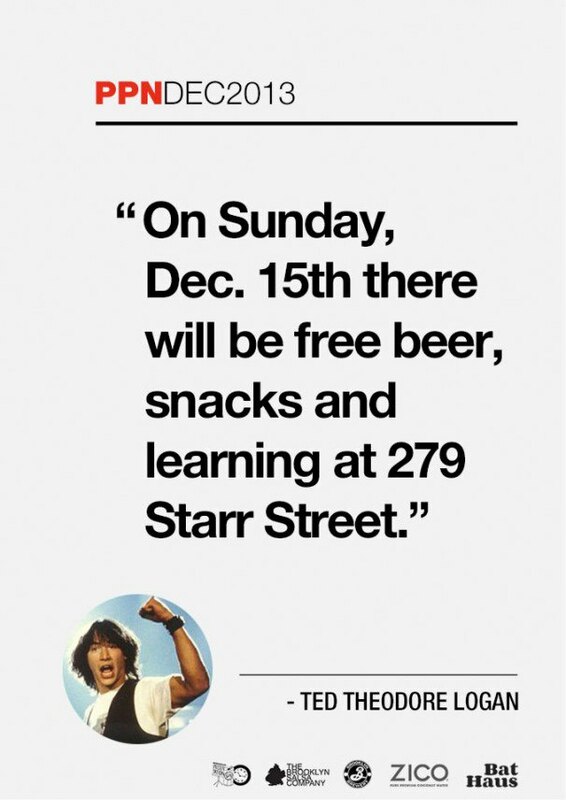 Bring your holiday cheer, friends, and don't forget to RSVP here. 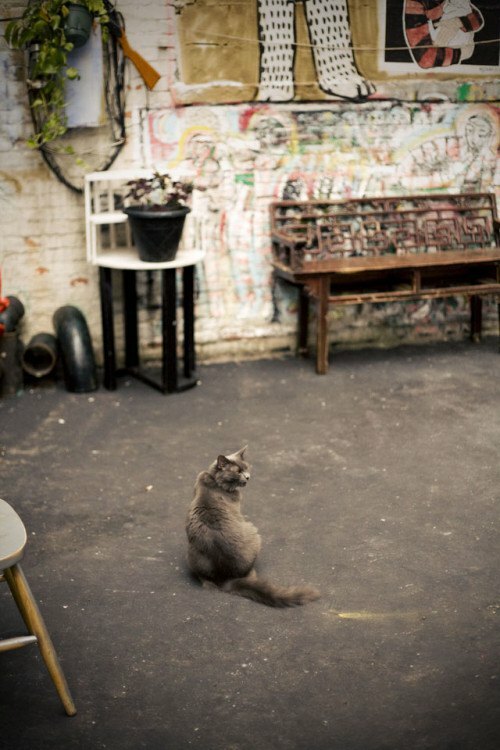 Fort Useless is a non-profit venue and collaborative art space with a mission similar to that of the popular co-op Silent Barn: "a hospitable space that can foster a community of like-minded artists and performers of various disciplines and connect them with each other." Here you'll see a less experimental community of up-and-comers and a much friendlier vibe. They've got shows on a regular basis, including a Birds in Weather Release Party this Saturday, and an art gallery opening from Hans Viets on Friday ,December 13th. 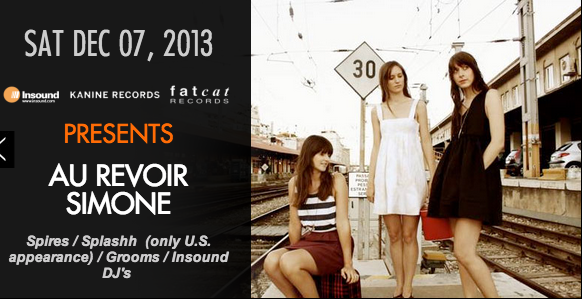 On December 14th, they host another show featuring band Miniboone, which doubles as their own holiday party! Check it out! 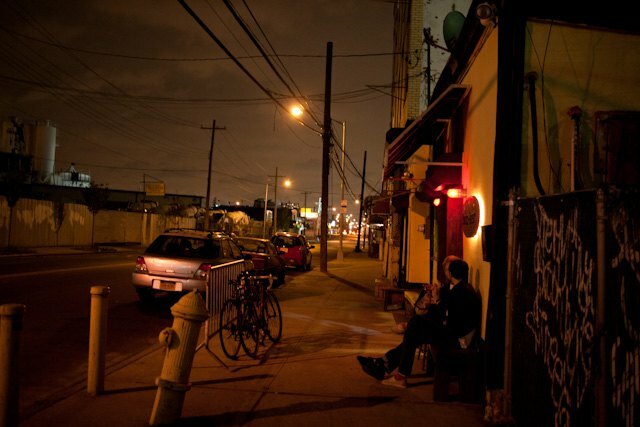 The Night Bazaar may not be in Bushwick but it will be worth the trek to see so much great, free, live music. A few noteworthy bands on this month's schedule: Au Revoir Simone (12/7), Small Black (12/13), Diarrhea Planet (12/14) and many more TBA. Oh, there's also shopping from local vendors - offerings range from ukuleles to essential oils to vintage clothing - glow put, ping pong, and lots of food! 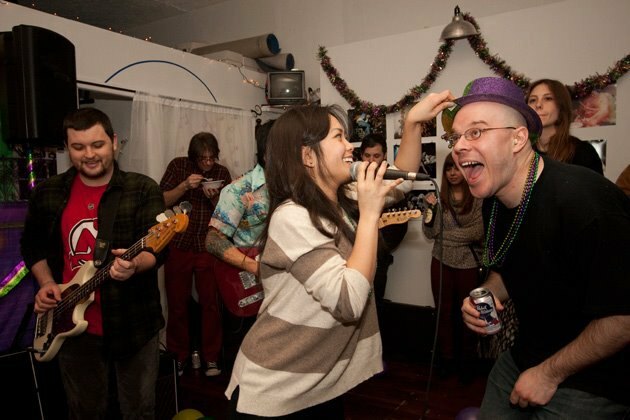 Presentation Party Night is a monthly event with presentations about everything under the sun in a Ted Talks meets Bushwick-style occasion. There are four to six presentations and the evening is organized as a potluck style with sponsorship from Brooklyn Brewery and Zico coconut water. This month’s topics will include 10 Presentations in 10 Minutes, The Druid Underground Film Festival, Metaphors, The Not-So-Wonderful World of Disney and more! Bring some chips, learn about Disney and then sign up to do your own presentation if you are so inclined! The Clocktower is bringing to Silent Barn a pop-up theatre event; John Mejias' I'm Wurried is a shadow puppet play based on collected recordings of young children explaining what they are afraid of. Prior to the puppet play, Julia Wertz, a Brooklyn comics artist of The Fart Party, will be reading and after the play there will be a stage performance by Jeffrey Lewis, a comic book writer/artist/musician who has performed with Devendra Banhart, The Mountain Goats, Stephen Malkmus & The Jicks, Thurston Moore, and more. Tickets are only $7 and are available for purchase right here! This Friday belongs to Winter Solstice and an amazing chance to experience an immersive food and music night over at Light Space Studios (which is the great space that also hosted this year's Bushwick Film Festival). 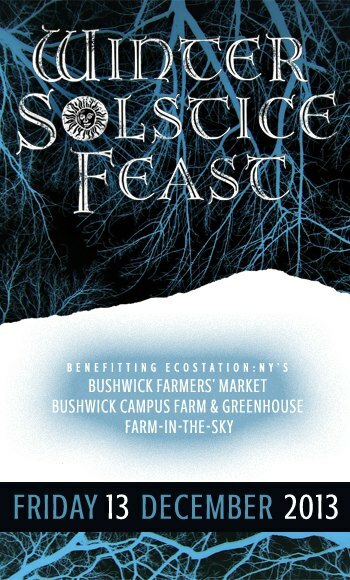 Winter Solstice Feast will be hosted by EcoStation:NY and benefitting their local food justice and urban agriculture projects: Bushwick Farmers' Market (and its new, vegetable oil-powered Bushwick Farmers' Market Green Machine), Bushwick Campus Farm & Greenhouse (and related youth and adult apprentice programs), and rooftop farming project Farm-in-the-Sky. Did we mention that they have an amazing raffle going on? You can win a fancy food blender to make your own almond butter, roller skates (yaaay! ), chocolate bars, consultations with nutrition experts and MORE! Buy tickets online or right at the fundraiser. In any case see you there! If you love Showpaper as much as we do, you won't miss their awesome benefit this upcoming Friday at a loft on Stewart Ave. 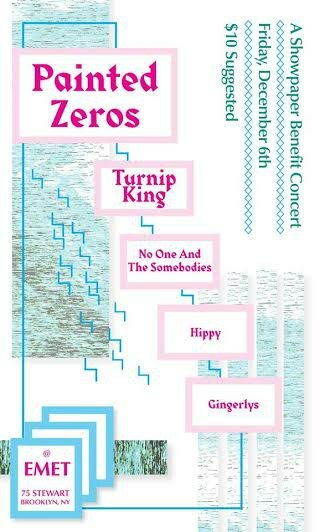 Some serious indie music includes Painted Zeros, Turnip King, No One and the Somebodys, Hippy, and Gingerlys. December pairs well with Ridgewood because of the abundance of Christmas lights on the streets and the small town nostalgia effect. 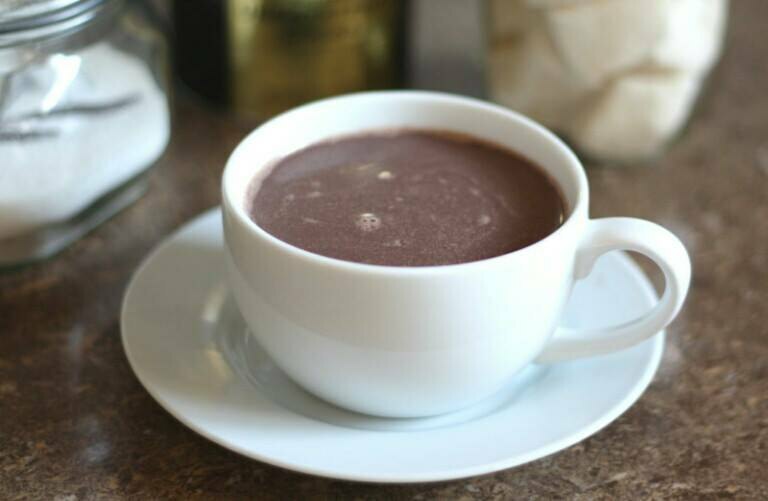 While walking Ridgewood streets in holiday awe, make a stop at Rudy's, an adorable old timey bakery and cafe for a super-delicious homemade hot chocolate. You've hardly ever tasted anything better than that! 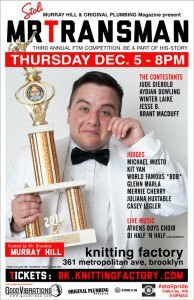 Gender-bender icons Murray Hill and Original Plumbing magazine dedicated to the sexuality and culture of FTM trans guys, are inviting everyone for the 3rd annual MR. TRANSMAN 2013 FTM (female-to-male) competition. So what's going down? Six diverse transmen from the local community will compete for the MR. TRANSMAN 2013 title in the following categories: PLATFORM, SWIMSUIT, INTERVIEW, TALENT, and EVENING WEAR. They will be judged by a panel of celebrated trans personalities. The winner will receive a cash prize, a photo spread in Original Plumbing. Yeah! 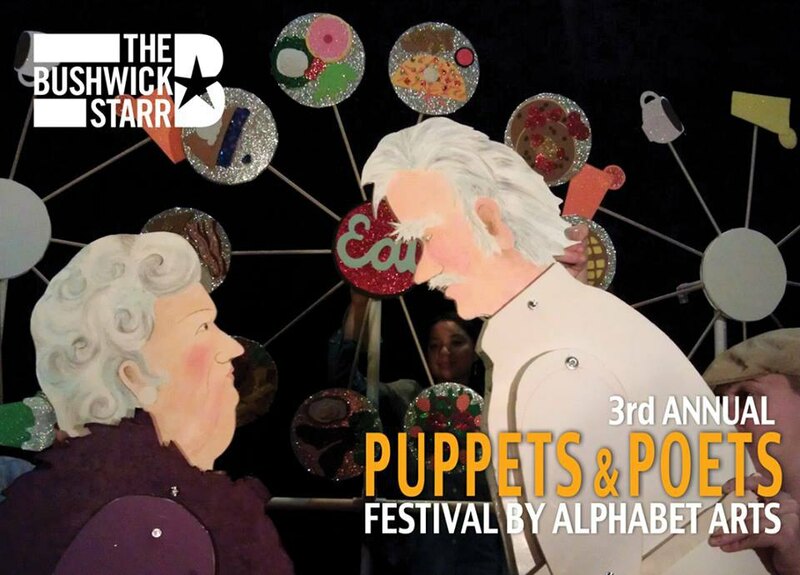 The Puppets & Poets festival explores and celebrates poetry and puppetry! 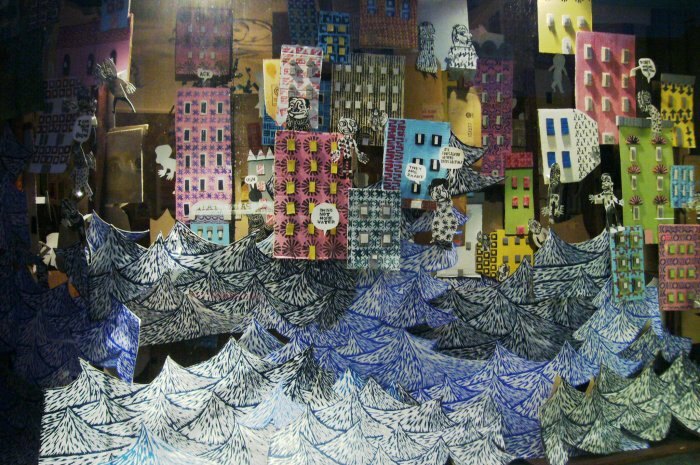 The third annual festival features poets, puppeteers, musicians, actors, dancers, and other artists from NYC, Philadelphia, San Francisco and Austin in an evening cabaret program for mature audiences and a family-friendly matinee program. 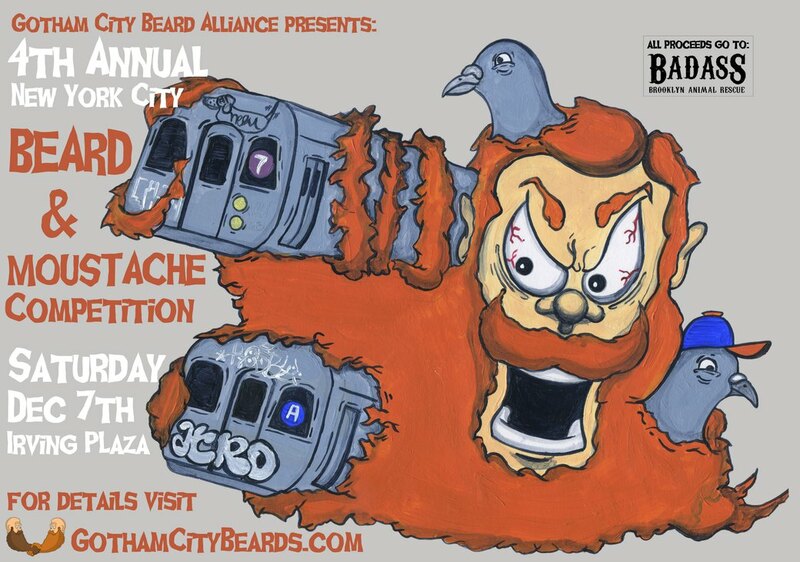 The biggest event of the year for all of you who have been obsessively growing and grooming your facial hair is coming this Saturday to Irving Plaza. A contest and a spectacle of beards and mustaches will go down in the following categories: Full beard longer than one foot; Full beard under one foot; Partial Beard; Groomed Beard; Freestyle; Chops/Sideburns; Styled Mustache; Natural Mustache; Fake Realistic and Fake Creative. Good luck, beardos! 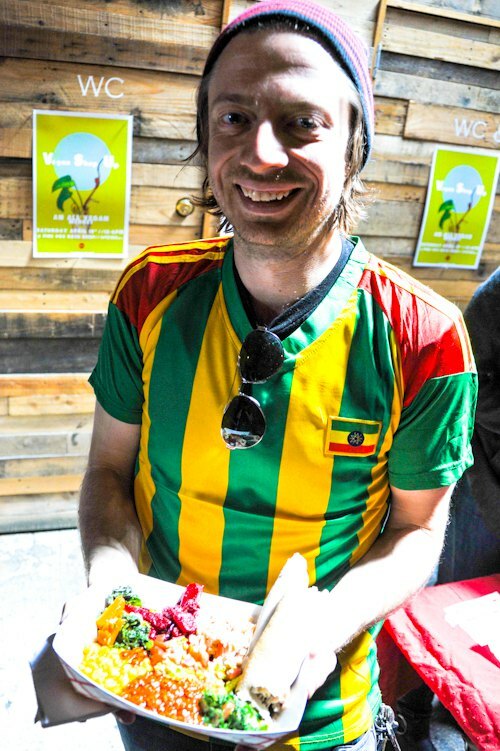 Everybody in Bushwick loves Sam Severance and his lovely Ethiopian pop-up, Bunna. But I mean, there are only so many times you can pop-up; at some point you want a nice steady place where people can find you every day, especially if you're as popular as these guys. After their summer and fall residency at Mama Joy's, a Southern-style restaurant on Flushing Ave, which announced that it was closing its doors recently, rumor had it that Bunna might move into the space permanently. Sam did not confirm this info but promised to let us know as soon as possible, so stay tuned and in the meantime follow Bunna on Twitter because that's where they are announcing their daily open hours on Flushing Ave. Kudos to Jazzabells Boutique and The Living Gallery for what promises to be another important community endeavor! Jazzo and Nyssa are starting a series of monthly discussions, the goal of which is simply to get to know your neighbors. The women strive to create a safe and welcoming environment where "we can begin to erase stereotypes and negative energy that surround our community." The first meeting will discuss the mission. The topics for the upcoming months include gentrification, race, gender, economy and more. If you're experiencing cold December in the unwelcoming industrial East Williamsburg/Ridgewood area, I have two magical words for you to change your sad cold night into a warm and fuzzy dreams: PHO GA. Yes, chicken soup from Bunker is heavenly. Actually, anything you get at Bunker is heavenly. But Pho will keep you nice and warm. Don't forget to bring your friends and a six pack! The place is BYOB!